Nothing quite tingles the palate like a good Thai meal. 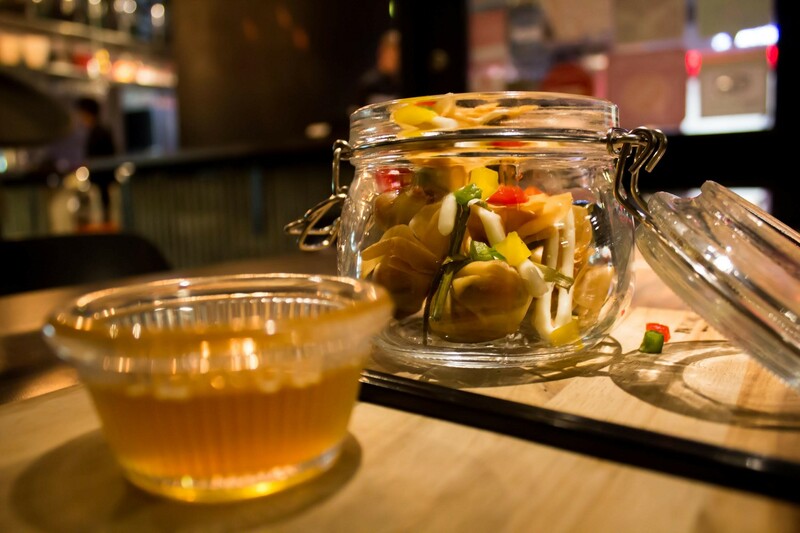 Hearty and full of robust flavours, Fa-Ying showcases traditional Thai flavours with a modern twist, using current “in-trend” ingredients and displaying them with finesse, while still staying true to their delicious roots. Not to be confused with fusion food, Fa-Ying serves up beautifully plated dishes that have quintessential Thai flavours, while finding new ways to keep it fresh and to suit those looking for something more “lifestyle” in today’s busy world. Upon arrival, we were greeted by Hazel Khoo, who’s in charge of marketing. Stepping into Fa-Ying, the first thing my team and I noticed was the decor. Antique, intricately carved clay statues adorned the walls and counters. The ambient lighting was a little dimmer than your usual eatery and made the setting pretty chill and romantic. What really got me was their attention to detail: all their wooden boards they serve the food on had a burnt print of their logo on them, even their coasters had an adorable monkey design printed on them. We couldn’t wait to try their food! The first dish that came our way was the Royal Money Bags. I loved the way they’d really paid attention to how they serve their dishes: the wooden board and glass jar gave the food a really ‘hipster’ vibe. Stuffed with a delicious minced chicken filling, these perfectly wrapped golden parcels were such a joy to eat. Crisp on the outside and succulent on the inside, these little bundles were served with a spicy sweet and sour manow sauce that complimented them nicely. This appetizer definitely did a good job at whetting our appetites for more! Next up came Anna’s Salad Wrap. Now, this was quite an interesting dish as it required a bit of hands-on action! In order to enjoy the full delight of this dish, one must layer the lettuce leaf with a flat rice noodle, put a spoon full of yummy chicken and salted fish filling, add a sprig or two of coriander, and top it into the garlic and green chili manow sauce before putting the whole thing in your mouth (big bites here!). This was fundamentally a ‘deconstructed salad’, and the fact that you got to play with your food made it (albeit messy at first) that little extra bit yummy and fun. We started on the entrées with a delightfully green pasta dish. 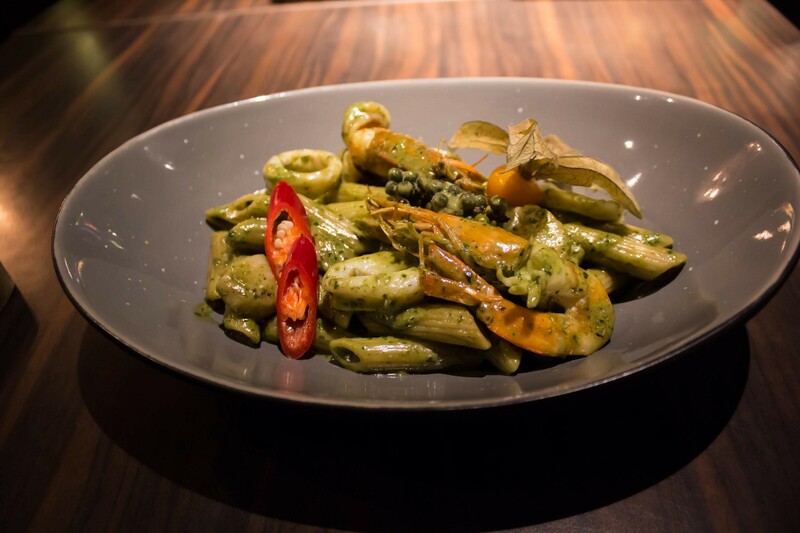 The seafood penne with spinach pesto was cooked to perfection: the pasta was al dente, and seafood was bouncy and not overcooked. The flavorful pesto really brought out the sweetness of the seafood, and the Thai peppercorns on top really completed the look of the dish. This is definitely something to try! Last but most definitely not least came my favorite dish of the night. This was a dish that basically embodied Fa-Ying’s “modern take on traditional” concept perfectly: Spider Thai-ger. 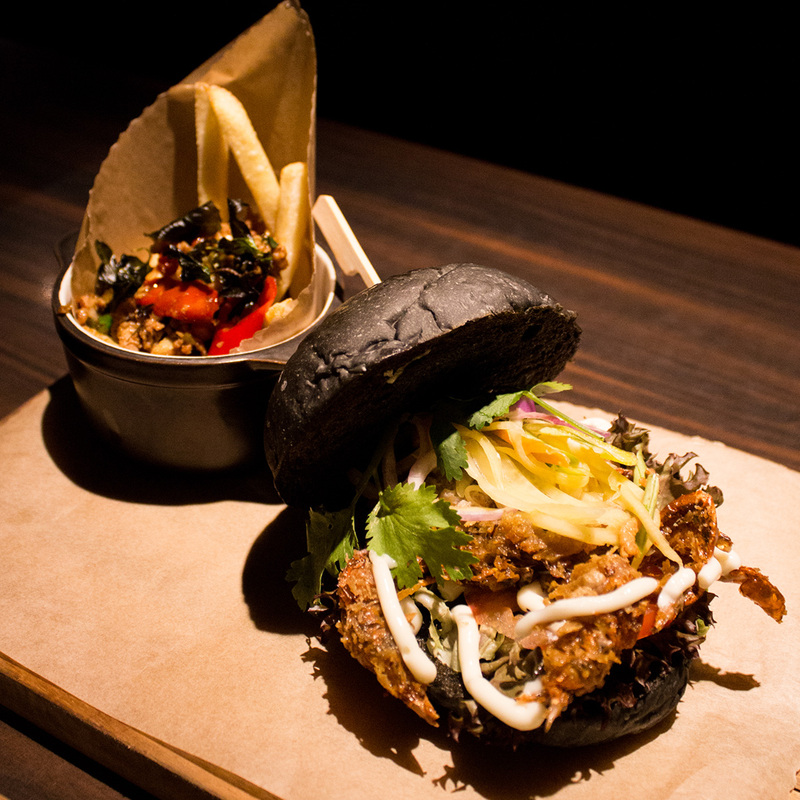 This burger consisted of charcoal black buns encasing a crispy yet succulent soft shell crab topped off with a zesty, tangy salad served with an interesting combination of golden french fries and stir fried minced chicken with basil on the side. Boy, oh boy was this a pleaser! The burger was crisp and juicy in all the right places, and the sweet, sour and salty flavours played beautifully together. 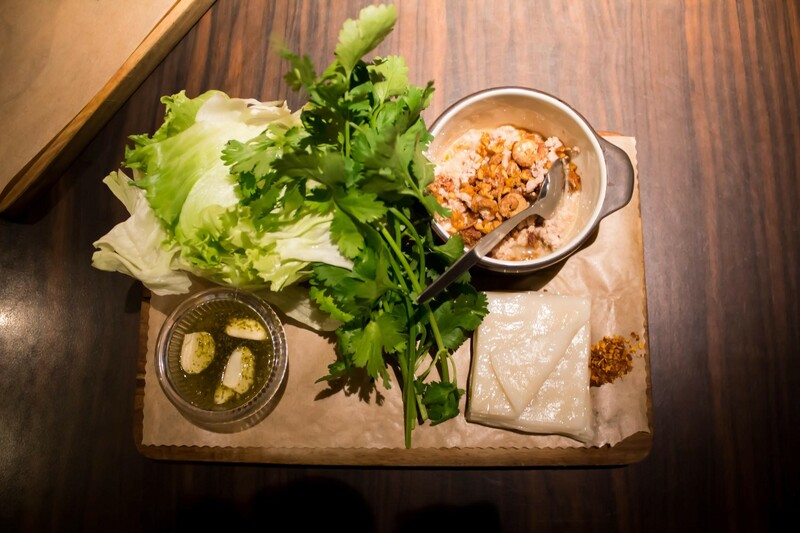 It was a really good take on modernizing Thai cuisine! I was especially impressed by the creativity on the fries: it reminded me of a Chili Con Carne on fries, but with Thai basil chicken instead! 10 points to Fa-Ying for that! Fa-Ying has presented some pretty amazing Thai food that has tickled our tastebuds with their flavours and our minds with their creativity. Their concept of showcasing modern Thai dishes in a lifestyle setting has elevated the dining experience of a familiar cuisine. We’ll definitely be back for seconds, thirds and fourths!